Love pugs in costumes? Then welcome to the Pug Costume Mega List! Want to see some of the best pug costumes? Then you've come to the right place! We've scoured the web and found the cutest, sweetest, scariest pug costumes out there! So if you want a pug in disguise or looking for pug costume ideas for this upcoming halloween take a peak and let us know what ya think! Enjoy the slideshow above with some of the cutest pug costumes, including Mr T Pug, Game of Thrones Pugs, Star Trek Pugs, Star Wars Pugs, and more! Below we list our top 12 favorite pug costumes for 2017 aaaaaaand if that wasnt enough, we compiled the pug mega costume list at the bottom of the page! Over 150 pugs in costumes to give you awesome ideas for halloween or just bringing a smile to your face! Enjoy! 1. A complete style of dressing, including all the clothes, accessories, etc, worn to make a pug look like a person, ie a superhero, a fireman, a policeman. 2. a set of clothes, esp unusual or period clothes, worn by a pug for comedic appearance. ie A Pug in a taco costume. 3. An outfit worn by a pug to make him or her look like another animal. check out our instagram feed of PUGS IN COSTUMES! #1 - Cheek Pinching Pug Unicorn Costume! @homerpugalicious has some of the best pug costumes around. We think this unicorn is one of the cutest! #2 - The Pugs Of Middle Earth! #3 - Star Wars Pug Costumes!!! The amazing @chubbsthewampug is a huge huge huge star wars fan. Chubbs's mom makes all their own star wars costumes and they are amazing! If you want to learn how she makes them, check out our interview with Chubbs here! Pikachu is one of our all time favorite puppy costumes! Mostly because pik is full of lightning and is a major cutie patuti! If you want your own pikachu costume, we got ours here. #5 - Michael Jackson's Thriller! The amazing people @itsdougthepug have done it again! They recreated the whole thriller video, staring Doug in his amazing michael jackson costume! #6 - More Snackies Please! @homerpugalicious shows us the true meaning of snackies. #7: Exercise? I Though You Said Accessorize!?!? @itsdougthepug is the king of costumes and the prince of accessorizing! We all know that the key to a good pug costume is the accessories. Those little bits that make the whole outfit come together! Who doesnt love a topical costume. Since were based in brooklyn, we gotta give a shout out to this amazing taxi costume from @gwentheblackpug. She is also the "keeper of the pug zoo" and graces us with amazing animal pug costumes every week! Check out our interview with gwen and see some more amazing pug animal costumes! TFW the new iPug comes out and you simply have to get one! Who doesnt like pizzzzzzza! Combine that with pugs and you have the making for some viral pug costumes right there. Check out more pizza pugs here. #11 Jewish Pugs are back baby!!!! #12 OMG Pug Dressed As A Pug Costume! Its so meta, my brain just exploded. And if that wasnt enough! Here are 150 more pug costume ideas! 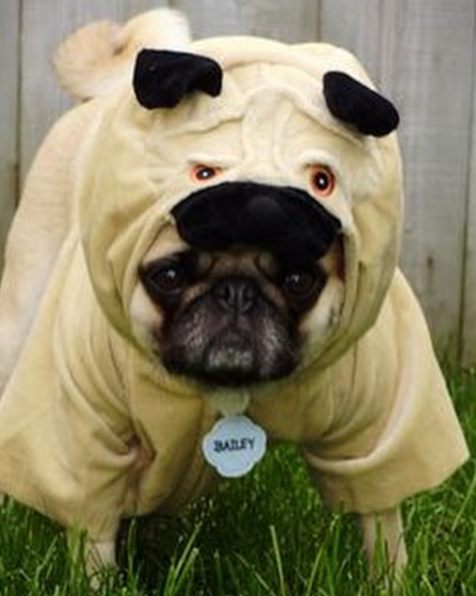 The biggest list of pug costumes on the web! WANNA SEE SOME PUGS IN GLASSES?